2016 has been quite the success story for Nelson and Colne College – with the academic year ending on a high as staff and students celebrate an outstanding 99.9% pass rate this A Level Results Day! The outstanding achievements come after government data placed the college number one in Lancashire for the progress students make in their A Levels, and number one in the area for vocational studies. NCC has also recently been named number one in the country for apprenticeship success. 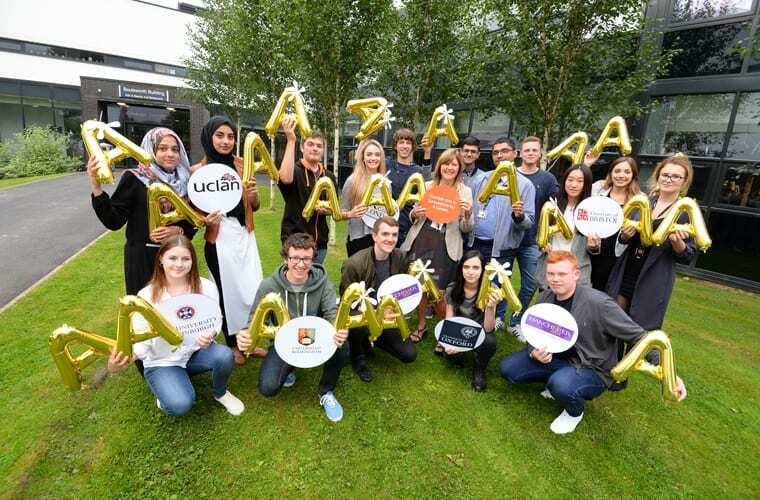 More than half of students achieved coveted A* to B grades, while many are going on to study at top universities across the UK, including the University of Oxford, University of Warwick and the University of Manchester. Many subjects have seen a rise in A* to C grades, including Psychology, which is up by 14%, English Language which has risen by 11% and Further Maths – which has gone from 78% A* to C to 100%. Film Studies, Photography and Textiles A* to B have had another excellent year, achieving 100% A* to B pass rates. Vocational students have also seen great success, achieving a 100% pass rate for the second year running, and over Summer have been able to celebrate securing exciting destinations, from University, to full-time jobs, to apprenticeships. Nelson and Colne College Principal Amanda Melton said: “It is always an absolute pleasure to see our students and staff jumping for joy on A Level Results Day, and I could not be prouder that we are announcing a 99.9% pass rate for our A Level students. “The transition from school to College is a big leap, and one that requires a huge amount of focus, independence and dedication from students. It is fantastic to see that the efforts of the Class of 2016 have paid off, and it has been lovely to see them smiling and celebrating with their family and friends. “We have seen more than half our students achieve A* to B grades, and this is also testament to our outstanding staff, who always go above and beyond to provide students with the best learning experience possible. During A Level Results morning, the golden graduates also had an opportunity to get into the spirit of the Olympics 2016 – running past NCC’s finish line and getting ready for their next step after College. As well as boasting excellent teaching, support, and facilities, Nelson and Colne College is dedicated to offering students an “overall” experience, including extensive enrichment opportunities and careers support, which will help them get ready for their future. Nelson and Colne College has also been graded as Outstanding by Ofsted since 2005. Following GCSE Results Day next week – Thursday, August 25th – students looking to join NCC and become a part of their success story can enrol from 9.30am. For those wanting more information or who cannot make that date contact NCC’s Admission Team on 01282 440272. Go to the Nelson and Colne College Sixth Form Facebook page for more pictures from A Level Results Day.